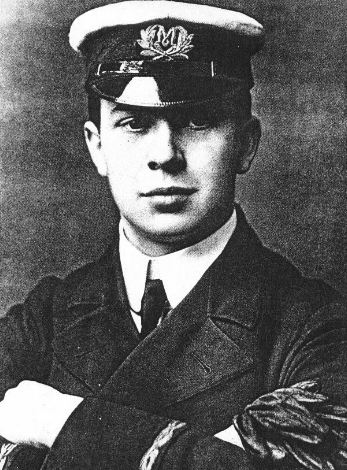 John George "Jack" Phillips (11 April 1887 &ndash; 15 April 1912) was a British wireless telegraphist who died while on the Titanic after it hit an iceberg; he was serving as senior wireless operator on board the maiden voyage of the . As the Titanic was sinking, Phillips worked tirelessly to send wireless messages to other ships to enlist their assistance with the rescue of the Titanic's passengers and crew. While Phillips has borne criticism for having told the radio operator of the Californian, "Shut up! I am busy, I am working Cape Race!" when interrupted on-air by his counterpart telling him that his ship was surrounded by ice, similar warning messages earlier that day had been delivered to the captain and a lookout had been posted. Phillips' first assignment was on the White Star Line ship Teutonic and he later worked on board the Campania, the Corsican, the Victorian, the Pretorian, the and the . In May 1908, he was assigned to the Marconi station outside Clifden, Ireland, where he worked until 1911, when he was assigned to the and later, in early 1912, to the Oceanic. On the evening of 14 April, in the wireless room on the boat deck, Phillips was sending messages to Cape Race, Newfoundland, working to clear a backlog of passengers' personal messages that had accumulated when the wireless had broken down the day before. Bride was asleep in the adjoining cabin, intending to relieve Phillips at midnight, two hours early. Shortly after 9:30 pm, Phillips received an ice warning from the steamship Mesaba reporting a large number of icebergs and an ice field directly in the path of Titanic. Phillips acknowledged the Mesaba's warning and continued to transmit messages to Cape Race. The Mesaba's wireless operator waited for Phillips to report that he had given the report to the bridge, but Phillips continued working Cape Race. The message was one of the most important warnings Titanic received, but it was never delivered to the bridge. Later, when standing with others on the upturned boat, Phillips explained when I said that I did not recollect any Mesaba report: "I just put the message under a paper weight at my elbow, just until I squared up what I was doing before sending it to the Bridge." That delay proved fatal and was the main contributory cause to the loss of that magnificent ship and hundreds of lives. Had I as Officer of the Watch, or the Captain, become aware of the peril lying so close ahead and not instantly slowed down or stopped, we should have been guilty of culpable and criminal negligence. After 11:00 pm, Phillips was again interrupted by another ship, this time the . The Californian's only wireless operator, Cyril Evans, was reporting that they were stopped and surrounded by ice. The Californian was very close and the signal was strong and loud in Phillips' ears. Phillips quickly sent back, "Shut up, shut up, I am busy working Cape Race!" and continued communicating with Cape Race while Evans listened a while longer before going to bed for the night. This communication had important consequences. Firstly, Evans gave a warning of ice, which if heeded could have prevented Titanic's sinking. Secondly, Californian was the closest ship to Titanic. As the radio had been switched off by Evans, Phillips had no way of communicating with Californian should Titanic require immediate assistance, which it very soon did. Titanic struck an iceberg at 11:40 pm that night and began sinking. Bride had woken up and began getting ready to relieve Phillips when Captain Edward Smith came into the wireless room and told Phillips to prepare to send out a distress signal. Shortly after midnight, Captain Smith came in again and told them to send out the call for assistance and gave them Titanic's estimated position. Phillips began sending out the distress signal, code CQD, while Bride took messages to Captain Smith about which ships were coming to Titanic's assistance. At one point, Bride jokingly reminded Phillips that the new call was SOS and said "Send S.O.S., it's the new call, and it may be your last chance to send it." A myth developed after the disaster that this was the first time SOS was used, but it had been used on other ships previously. After taking a quick break, Phillips returned to the wireless room, reporting to Bride that the forward part of the ship was flooded and that they should put on more clothes and lifebelts. Bride began to get ready while Phillips went back to work on the wireless machine. The wireless power was almost completely out shortly after 2:00 am when Captain Smith arrived and told the men that they had done their duty and that they were relieved. Bride later remembered being moved by the way Phillips continued working. While their backs were turned, a crew member sneaked in and attempted to steal Phillips' lifebelt. Bride saw and grabbed the man as Phillips stood up and knocked the crew member out. The water was beginning to flood the wireless room as they both ran out of the wireless room, leaving the unconscious crewman where he fell. The men then split up, Bride heading forward and Phillips heading aft. "Phillips, the senior wireless operator, standing near me, told me the different ships that had answered our call..."
Harold Bride reporting seeing Phillips' body as he boarded the Carpathia. Whole or part of the information contained in this card come from the Wikipedia article "Jack Phillips (wireless officer)", licensed under CC-BY-SA full list of contributors here.